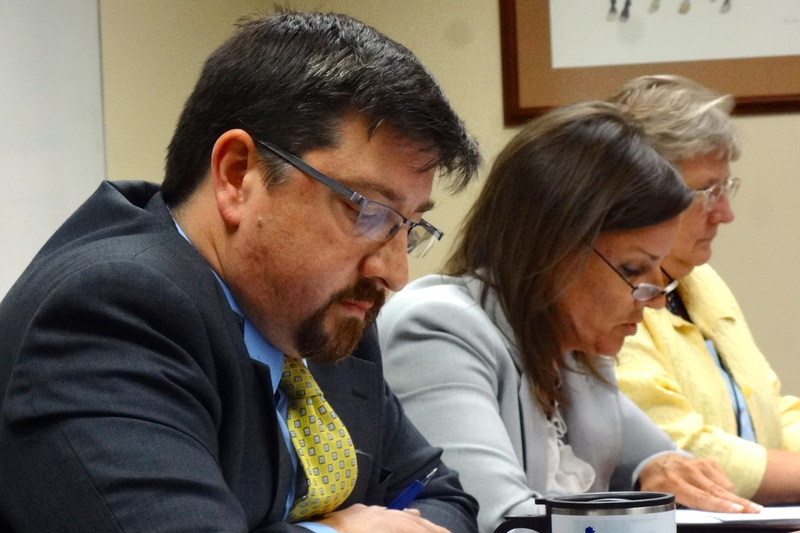 DoA Legal Counsel Greg Murray and Executive Assistant Wendy Coomer during the public hearing. The Department of Administration held a public hearing on the emergency rule and proposed permanent rule to amend Chapter Adm 2 relating to Use of State Buildings and Facilities. You may submit your own comments, facts, opinions, and arguments to the DOA in writing as well. Written comments may be submitted to Donna Sorenson, Department of Administration, PO Box 7864, Madison, WI 53707-76864. Or by e-mail: Donna.Sorenson@Wisconsin.gov. Or by fax: 608-267-3842. The deadline for submitting comments to the Department is 4:30 p.m., July 15, 2013. There is no threat to public safety and welfare. The Access Policies and Administrative Code have been revised to suppress dissent at the Capitol, largely in the form of the Solidarity Sing Along. 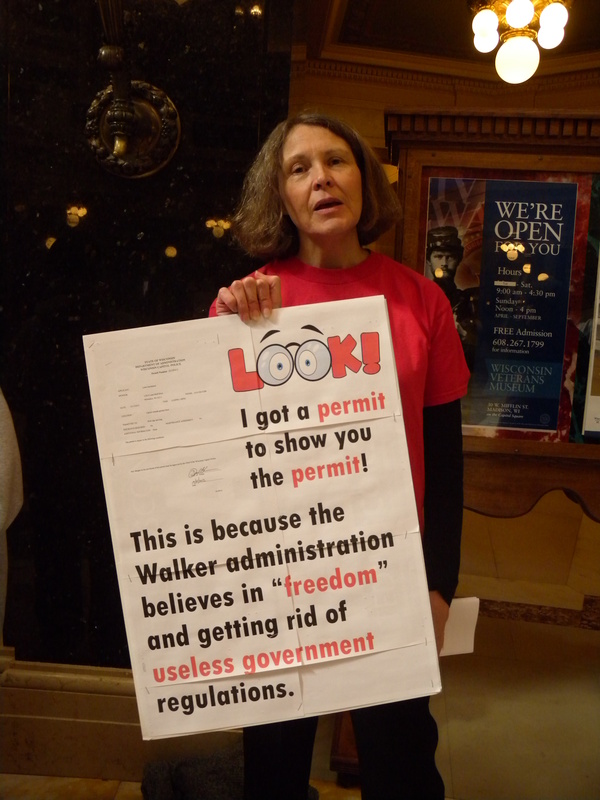 The occupation in 2011 was started by the “bait and switch” tactic used by Scott Walker. He ran a campaign based on government transparency and fiscal responsibility. He then “dropped the bomb.” Many people were surprised to find out that they were part of an elite class, known as public workers, who must make financial sacrifices for the good of the State. When Wisconsinites objected, they came to the Capitol to voice their concerns not only about their right to collectively bargain, but many other aspects of the budget repair bill as well, including cuts to education, cuts to BadgerCare, and the sale of public assets without bids. When the lawmakers decided they did not want to listen any longer, they broke the open meetings law, kept the public out of the process, and literally locked them out of the building. Citizens were denied entry into the “People’s House” if they did not have official business to conduct. The DOA then violated citizens’ 4th Amendment rights by subjecting them to illegal searches upon entering the Capitol. Lawsuits were filed. Judge’s orders were ignored. After months of constitutional violations by the DOA, the Capitol was eventually reopened to the public without the metal detectors and the excessive law enforcement presence that had become the custom. Citizens continue to come to the Capitol because they still feel locked out of the process. Most of the “bold reforms” that Walker touts end up in court. Decisions are made behind closed caucus doors, and my own Assembly representative is limited to two minutes of time on the floor. Am I being represented if my elected official is suppressed by the “gerry-mandated” majority? It is quite obvious that the Republican Party is not listening. But when I sing in the Capitol, I know they can at least hear me. No groups continue to “occupy” the Capitol. 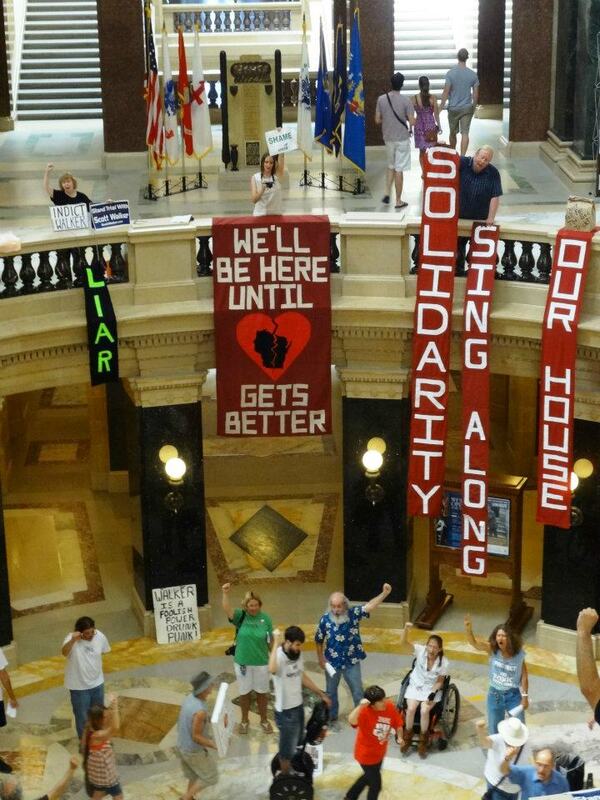 Citizens do show up for an hour at noon on weekdays to sing either in the rotunda or outside on the Capitol grounds. They have been doing this since the day after they were locked out of the Capitol. 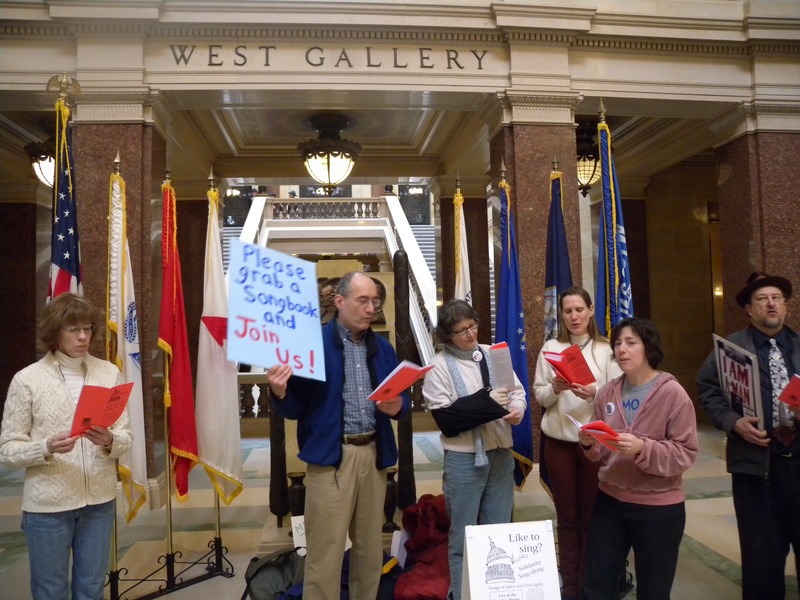 I stumbled upon that first Solidarity Sing Along while taking my daily stroll through the Capitol to take photographs of the Wisconsin Uprising. I can speak to some of the disruptions mentioned in your explanation for the need for new rules because I was there. The Red Cross holds many blood drives. When they held their first blood drive after the Sing Along started, the Red Cross was going to cancel their event because they found it hard to hear the donors over the singing. The Sing Along moved outside and has done so ever since when told there is a permit holder over the noon hour. At times, permit holders have offered to share the space with the Sing Along. One such time was when a tea party group came to the Capitol. They shared the rotunda for roughly half an hour and then said they wanted the Sing Along to move, so those who wanted to continue singing went outside. On another day, a woman took out a permit for herself to sing and hold a sign. She encouraged others to join her. On that day, there was singing both in the rotunda and outside. Disruptions to tours, committee meetings, and legislative sessions will not be stopped by changing the permitting process. No permit would be granted for such behavior, and the police already have the authority to cite individuals for disorderly conduct. When it comes to public safety and welfare, permits will not help. The only incidents of violence I have seen were acts committed against the Sing Along. I was at the Capitol when former state senator Dave Zien and his friends came out in support of concealed carry. Mr. Zien aimed his wheelchair at the feet of people singing on the ground floor and rolled around the circle. People jumped back so as not to be rolled over. His friends came up to the first floor with a Don’t Tread on Me Flag. I applauded when they brought it out. They then circled the people on the first floor and draped their flag over our faces.When a fellow singer tried to stop them, he was punched in the face for his efforts. John Schaeffer, a self-proclaimed counter-protester, used to come to the Capitol to yell at the Sing Along. He would also yell at elected officials (including, but not limited to Sens. Kathleen Vinehout and Spencer Coggs) and school children. His favorite chant was BO (Barack Obama) Stinks! It may even be John Schaeffer that Chief Erwin heard on that infamous day when someone scared a 5- year-old girl. Would the child not be scared if the screamer had a permit in his hand? The definition of an Event in Section 2.03 is unclear. One would think that participation in something called a Sing Along would involve singing, but the Capitol Police have proved otherwise. They have ticketed people for just being in the presence of the Sing Along. 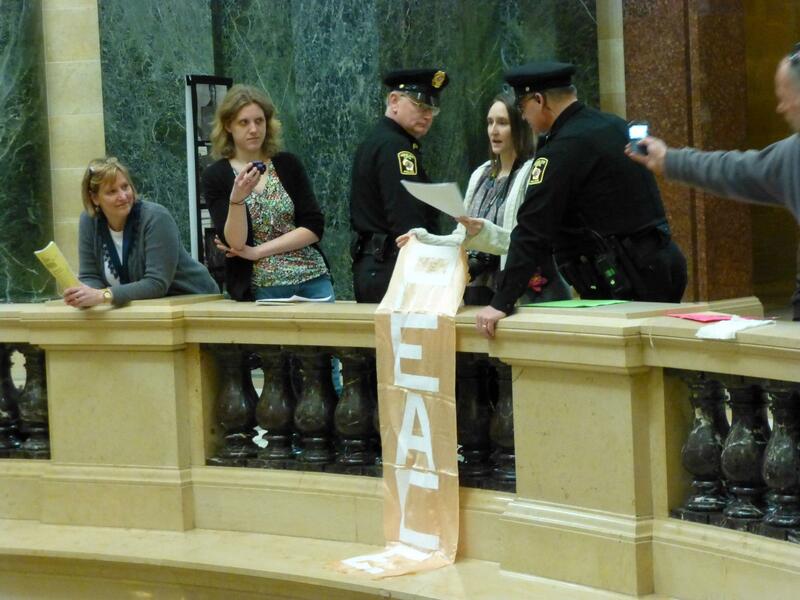 A judge ruled that people may hold signs in the Capitol as an expression of free speech. Another judge has ordered that groups of 20 or fewer do not need a permit. If people hold signs over the noon hour while 20 other people are singing, will the police decide it is now unlawful? Police have said that participation is “obvious.” It is anything but. Section 2.03(r) defines an Exhibit partially as signs or banners which are not held by an individual or which are larger than 28 inches. Does this mean that I may hold a banner larger than 28 inches? Or is new speech (sign and/or? banner) size limited to 28 inches in length or width? What purpose is served by this change? After holding large banners in the Capitol for over a year, I was approached by Capitol Police, who told me they were afraid I would drop a banner and someone would get hurt. It is true that banners have fallen on occasion, but no one was ever injured. I solved that problem by attaching a banner to my clothing, but then I was told I could not hold the banner over the balustrade, and the police confiscated it. My attorney sent a letter to the Capitol Police and the DOA requesting the return of my banner months ago and clarification as to why it was confiscated. We have received no response. Peace banner confiscated 2-6-13, photo by Erica Case. In Section 2.04(5), I commend you on adding sexual orientation to the list of items you cannot discriminate against. Kudos. For Section 2.07 regarding displays and decorations, again I have concerns regarding the size of an exhibit. Here it states that a person can hold a sign, but that it has to be no larger than 28 inches in length or width. I find this confusing as Section 2.03(r) seems to state if you hold a larger sign or banner it may be permissible. Section 2.14(2)(v): I have been charged under this section three times since Chief Erwin started interpreting the code. Two of my charges have been dismissed on the prosecutor’s motion. One remains as we were awaiting the judge’s ruling in the Kissick case before going forward. Again, the definitions of “conducts,” “event,” or even what amounts to participation in an event need to be better defined. Section 2.14(vm) discusses unlawful assembly. Unlawful assembly is specifically defined in Wisconsin Statutes. The activities of Sing Along participants and spectators do not rise to the definition of unlawful assembly but, on July 11, 2013, a few regular attendees of the Sing Along were approached by the police and told that if “active participation” numbers grew to over 20, they would be “enforcing” the number in Judge Conley’s order. When asked what “participation” meant, they were told “it is obvious” and refused to get more specific. When asked how they were supposed to know when the number exceeded the court order, the officer said when there are more than 20. 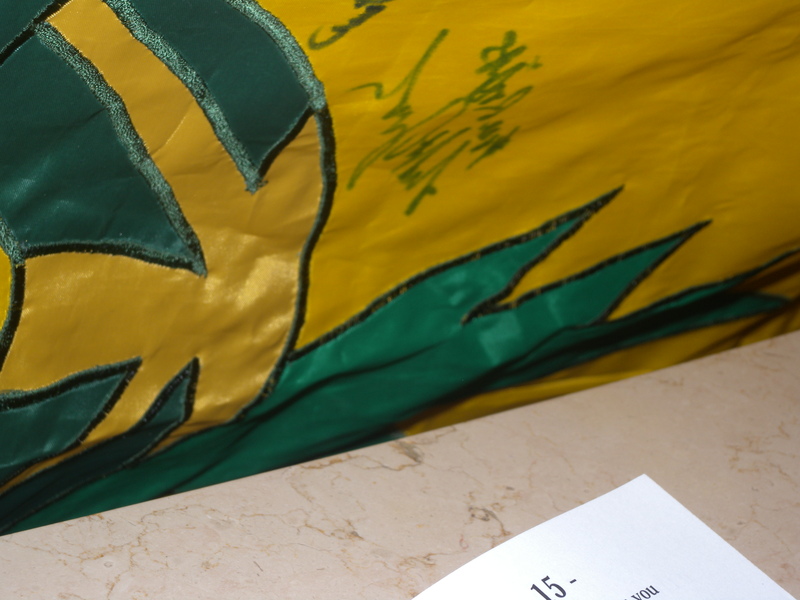 I have the right to petition my government. I have the time to do it on my lunch hour. Do I lose my rights when an officer decides that too many people are exercising their rights at the same time? Also in 2.14 (vm), spectators will now be prosecuted to the full extent of the law. Is that really the message you want to send to the public? That people engaging in constitutionally protected free speech activities are so dangerous, you should not even be allowed to watch them? 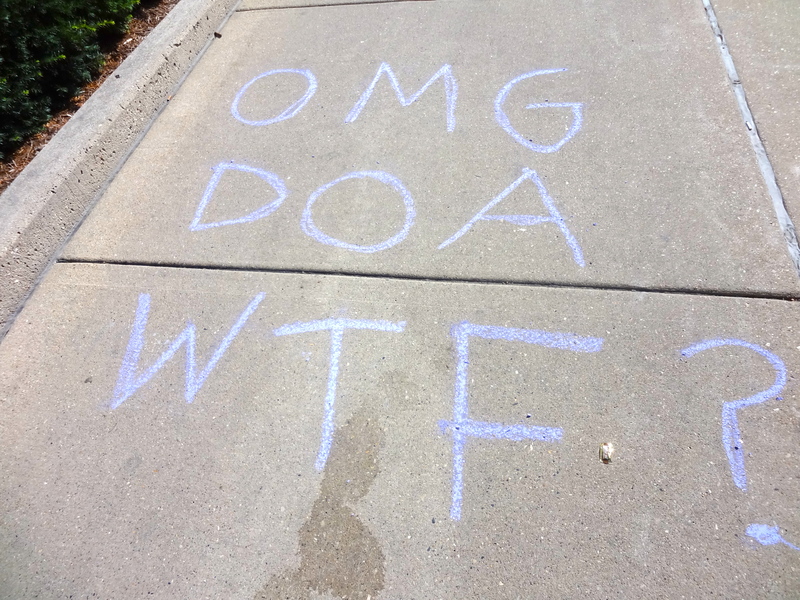 The sidewalk outside the Department of Administration building. Section 2.14(2)(vr)2 claims the department may designate officials to determine compliance with the code. If you are tasking the Capitol Police, under its current leadership, with this determination — heaven help us. The Capitol Police have shown that they cannot differentiate between lawful and unlawful behavior. They also cannot distinguish between members of a group and people who are not participating. They refuse to answer questions in person, in writing, or by telephone. I come to the Capitol to engage in constitutionally protected free speech. My reasons are many and varied. I come by myself, but amazingly enough, I have never been alone while there. I do not need to ask permission from the government to protest the government. I have, however, asked the Capitol Police on numerous occasions why my behavior warranted home delivery of citations, what constituted “participation” in an event, and how the police know if there is a “triggering event” that brings people to the Capitol. I have received no answers. Stephanie Marquis has never returned my phone call and Chief Erwin has not responded to my written note. Chief Erwin did have time, however, to go on a media spree and lie to the public to sway opinion regarding the Sing Along. On the day before 9-11, he even used the word “terrorizing” to explain the way attendees at the Sing Along treat others in the Capitol. The chief has Homeland Security clearance. I believe he chose that word for a reason — to paint a target on the backs of the singers. He also claimed that banners people held at the Capitol contained two by fours and metal pipes and were dangerous safety concerns. I personally brought a bag of many banners to the Capitol to express my views for over a year. None of them ever contained two by fours or metal pipes. I never saw any other banners that contained two by fours or metal pipes, and as I stated, I am at the Capitol often. The Capitol Police do not allow you to have signs on sticks in the Capitol. If there had been wood or pipes in any banners, the police would have asked for them to be removed. This was an intentional lie told to the public by a chief of police. Chief Erwin also instructed Capitol employees to use force — knuckle punch them in the nose — if they felt afraid of anyone at the Capitol. The role of the police is to protect and to serve the public, not to incite violence and spread lies. Please take the time to read Article 1, Section 4 of the Wisconsin Constitution: The right of the people peaceably to assemble, to consult for the common good, and to petition the government, or any department thereof, shall never be abridged. I cannot speak for anyone but myself, but I can tell you that I have come to the Capitol, peaceably assembled with others, and petitioned my government nearly every weekday for the last two years. I have been given four citations for doing so. My government not only refuses to listen to me when I petition them, but they have also targeted me for unconstitutional prosecution and persecution. And you wonder why I’m protesting? Truthfully, it makes no difference what changes you make to the Administrative Code. It is not being used to protect the public safety and welfare because there is no threat to the public safety and welfare. The Department of Administration is using the code to ticket and harass people who disagree with those in power. Because I choose to exercise my rights often, I have been a victim of these unconstitutional “no permit” tickets. I reiterate: I have the right to petition my government. I have the time to do it on my lunch hour. My rights do not cease to exist the moment a police officer counts 20 people in my presence and assumes we share the same viewpoint. Please stop the infringement of our rights. Change the code in whatever way you like, but stop using it as a weapon.